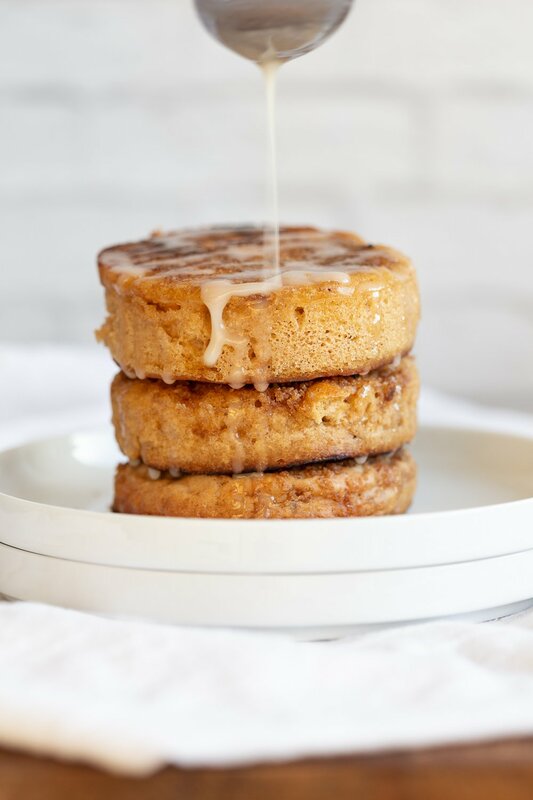 We all love a decadent breakfast once in a while and these Cinnamon Streusel Pancakes are just perfect for that! 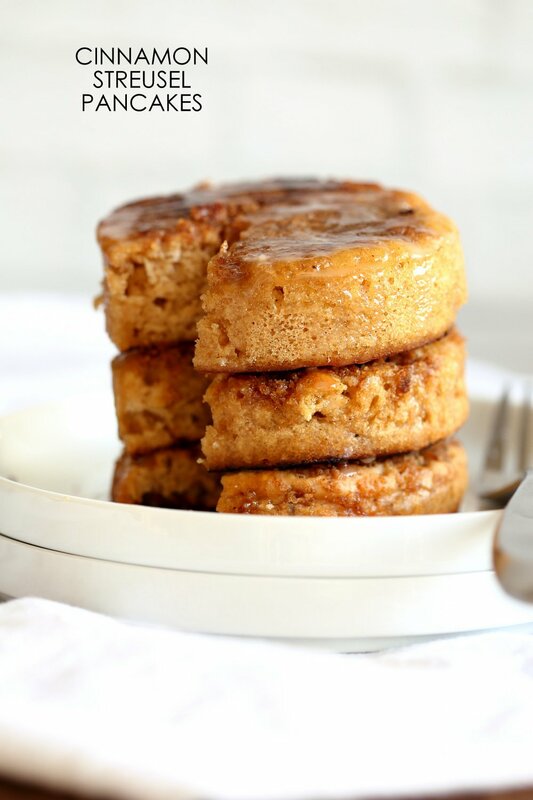 These tall soft pancakes are a cinnamon streusel cake/coffee cake in pancake form! If you make them using cookie cutters, then they are almost a Cinnamon streusel cake, no baking needed and ready within 25 mins! The batter is a simple vanilla cake batter that is cooked in a skillet. Sprinkle some streusel on one side, flip, cook and serve. I use Cookie cutters to make cake tower like my popular No Bake Chocolate Cake for 2- Chocolate Pancake tower (so decadent and ready in 20 mins!). You can make regular pancakes with the batter as well. Drizzle with maple, icing or top with some cream cheese frosting or whipped coconut cream and fruits! Make a whole baked cake with this recipe. 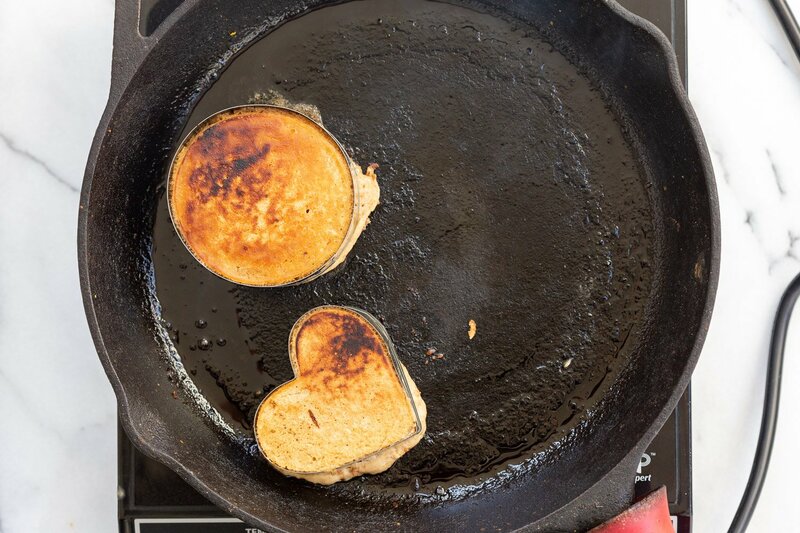 The pancake batter needs 1 Bowl, makes super fluffy pancakes with or without cookie cutters! Add berries or nuts for variation. The batter also makes great waffles. Chocolate Cake for 2, Chocolate Pancakes with ganache. Cookie cuter pancakes are cooked a bit differently than regular pancakes. Cook them on lower heat, don’t make them too thick, cook covered, cook for longer time. Higher heat tends to burn the bottoms before the batter on top has started to cook. Too thick pancakes wont cook in the middle. The batter rises a lot, so pour less to be on the safe side in the cookie cutter. I use large cookie cutters, (3.5 to 4.5 inch range works best) for these pancakes. The cutters get hot, so use the spatula to handle. After a try or 2, you will be able to figure out the amount of batter that works best to keep it easy and the best way to flip them. Add icing or vegan cream cheese frosting to make a No Bake Coffee Cake (cinnamon streusel Cake!) for 2. 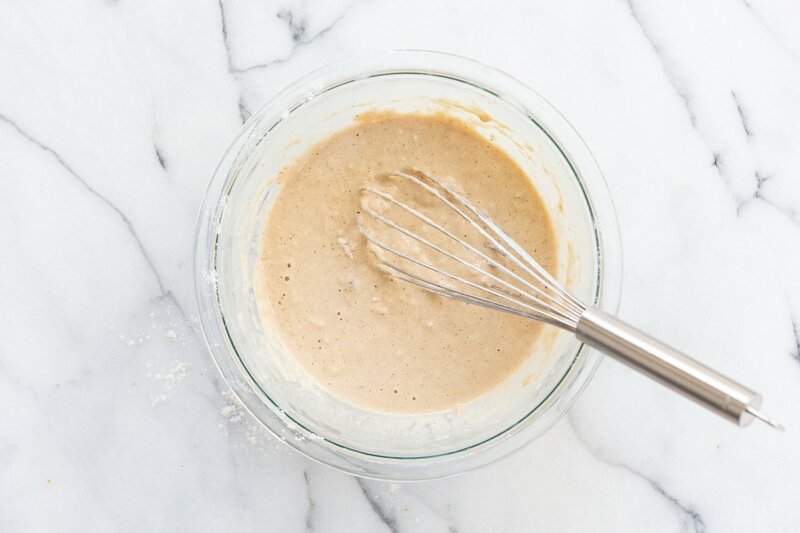 In a bowl, whisk the dry ingredients for pancakes until well combined. In another small bowl, mix 3/4 cup non dairy milk, vanilla and vinegar. Add to the dry. Add oil and mix. Add more milk 2 tbsp at a time. Depending on the flours you will need 2 to 6 tbsp more. Whisk to make a pancake batter that is not too stiff and also not too thin. 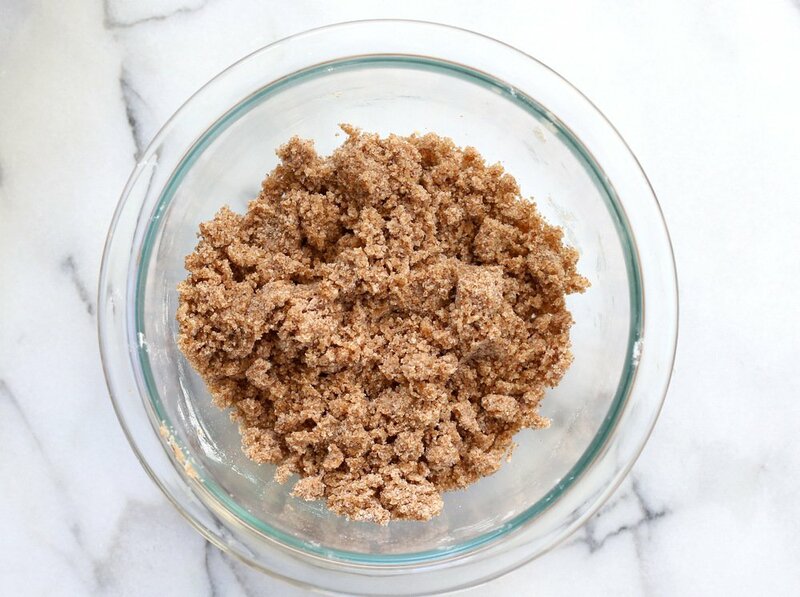 Mix the flour, sugar,salt and cinnamon for the streusel in a bowl. Add oil and mix to make a crumbly mixture. Heat a skillet over medium heat. Brush oil. If making regular pancakes: Pour batter on the hot skillet. Top with some streusel. Cover the pan and cook for 3 to 4 mins. Then flip and cook for another 2 mins. 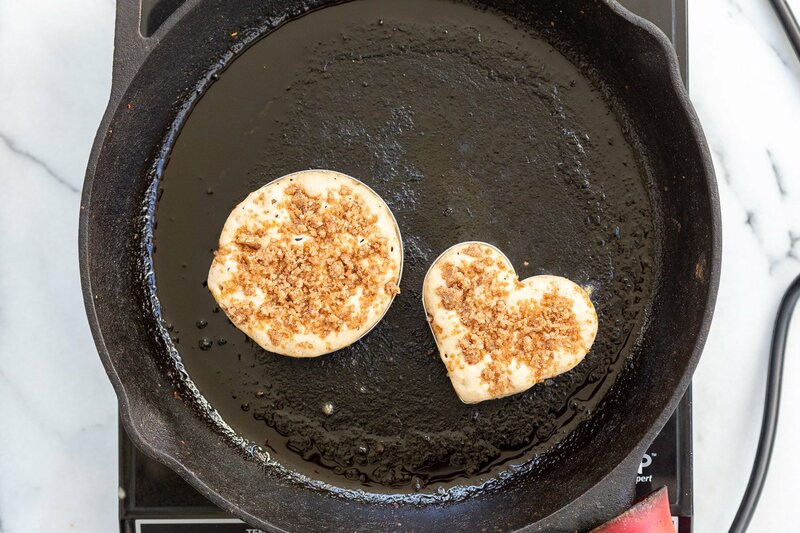 If making cookie cutter pancakes, Once the skillet is hot, place the cookie cutters on the skillet. Spray oil on the cutter. 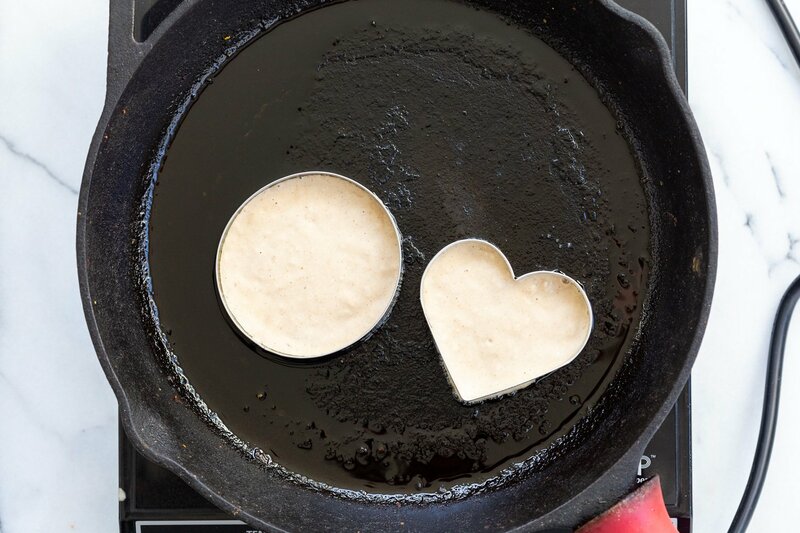 Pour pancake batter to reach a 1/3 to 1/2 of the height of the cookie cutter. Then sprinkle streusel. Cover the pan with a lid and reduce the heat to medium-low. Cook for 5 to 7 minutes, then flip the pancake with the cookie cutter and cook for 2 mins. Remove from pan. Let cool for a minute then carefully loosen the cookie cutter. Drizzle with maple, icing or top with some cream cheese frosting or whipped coconut cream and fruits! « Instant Pot Ziti with Tomato Sauce 20 Mins! Omg these look amazing Richa!! Trying them soon! Its a cinnamon streusel cake also called a coffee cake. The pancake batter would make a pretty small cake. This sounds so delicious!! Could you use this recipe for waffles? Turnwd out so beautifully as waffles! Thanks Richa!! Aw, I love how thick and fluffy these pancakes are! 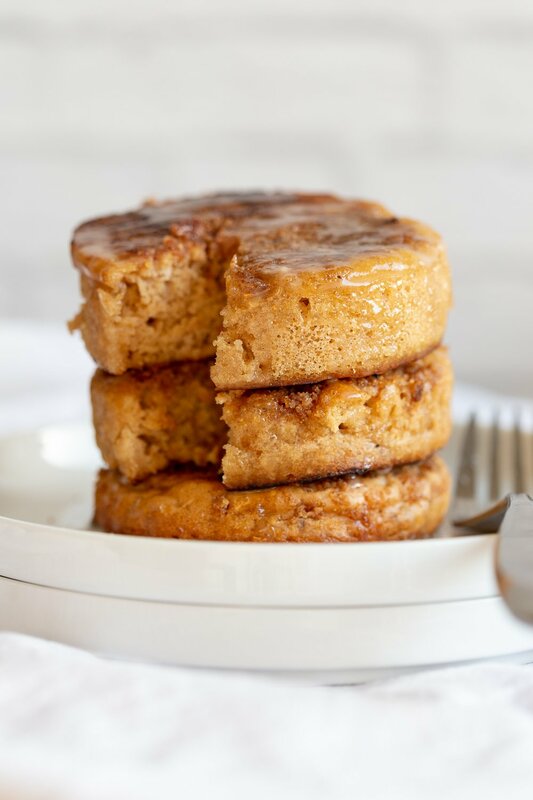 I bet this pancake recipe was so irresistible, especially when they were cooked and the toasty aroma of cinnamon and sugar filled the air! I totally would use this recipe any day if I wanted a super easy waffle or pancake breakfast. You can’t beat that! 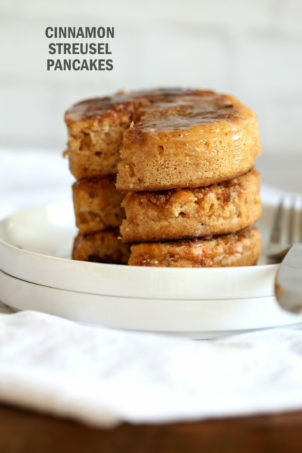 I made these and they were gooey and not thick at all. Where did I go wrong?